It all started with a beat-up filly named Gracie. 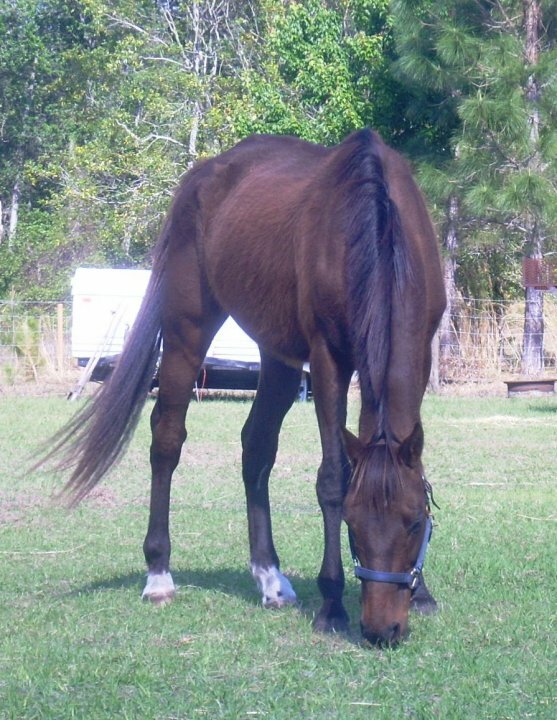 Her ears broken, her tail amputated, the horse came limping into Jennifer Carnahan’s life nine years ago. 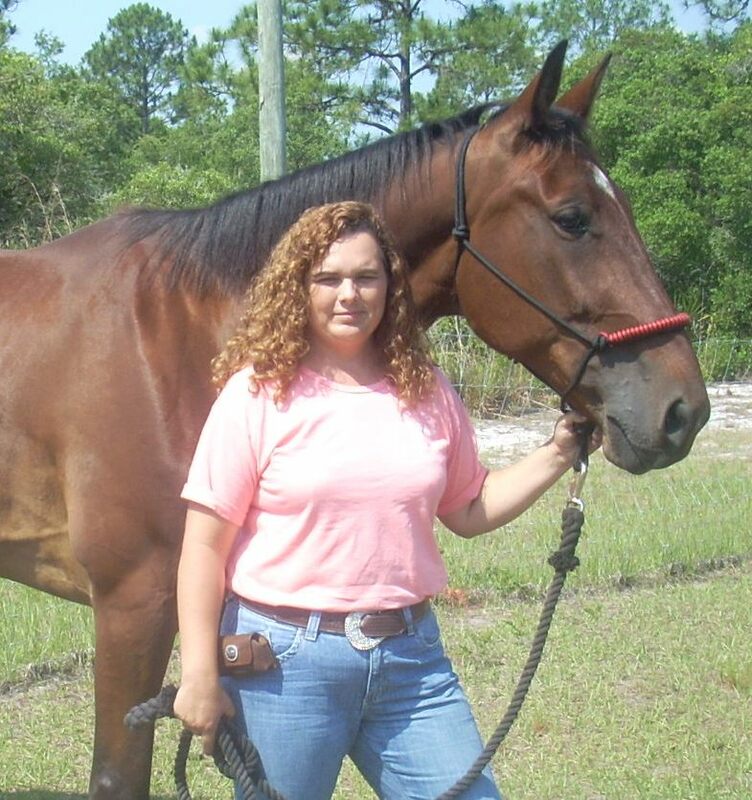 Although she didn’t live very long after her rescue from abusive owners, her memory inspires Jennifer Carnahan and husband Richard to work two jobs a piece to save and rehabilitate other horses who have run out of luck. “We started rescuing horses by accident,” Carnahan says. “When Gracie came to us, she had been severely abused. We provided medical care, and got her on her way into a new home, but the neurological damage had been too great” and she died a short time later. Since then, dozens of others have been more fortunate because of the couple’s dedication. Last year the couple rehabilitated and placed 25 horses through their licensed operation, Promise Acres Equine Rescue of Avon Park, Fla. Today, they are caring for six rescue horses, including two off-track Thoroughbreds, Tuff and Malachi, who arrived March 7 underweight and in poor condition. Abandoned by their owner, the horses were fed by neighbors after they realized the owner had left them. One well-meaning neighbor finally contacted Promise Acres when the $90 weekly feed expense became too much, Carnahan says. It’s a lot of money for the Carnahan’s too. But starting with Gracie, the couple decided that the expense of saving horses was worth working weekends as security guards to help subsidize their rescue. “It’s really not as bad as it sounds. We don’t work every weekend, just one or two a month,” she says. Running a horse rescue, on the other hand, is a 24-hour-a-day commitment, she adds. “Some days it does make you wonder,” she says, admitting she still doesn’t completely understand what motivates her and her husband to get up every day at 5 a.m. and roll into chores before heading to their regular jobs. Not to mention, the pair has two young daughters to rear. “I can’t say why it’s a calling. I was one of those teens who was sort of lost, I guess, and it was easier to grab on and fix something else. It started with puppies and kittens.” All the while, she wished for a horse. As soon as she graduated high school she moved to Texas to work with them. Later, when she returned to Florida, her dedication to animals continued. She worked for a veterinarian, a Humane Society shelter, and today directs a therapeutic riding program at a nonprofit organization. The mother of two girls ages 11 and 7, Carnahan finds life, with all its experiences, very rewarding. Even the tug-of-war debate she occasionally has about whether she should stick with horse rescue has never failed to deliver unexpected, fortuitous events, she says. Most recently, a 15-acre farm the couple had twice looked at but ruled out because of cost, had its price lowered. They moved in this past November. It was like a new beginning. Richard Crnahan, who is the fix-it, build-it person in the family, has already constructed a shedrow. Soon, he will spend his evenings after supper hammering together a more elaborate, 8-stall barn. Malachi, a 16-hand, 8-year-old, is pretty spunky. Tuff, a 17-hand, 12-year-old, is already proving to be a steady “sweetheart.” When volunteers from a local 4H came to help out, he stood stalk still while young girls gave him a bath, she says. These happy moments keep the couple going, because running a horse rescue is far from easy. THIS IS SO GREAT , THAT THERE ARE PEOPLE THAT DO CARE FOR ANIMALS. Rick&Jen are my nephew&my neice and i am so proud of them. I know that they have worked so hard for this that i hope & pray that there dream can come true. Jennifer and her family are the best. The kids are just as concerned for the animals as the parents. What a great thing to teach your children. Keep up the good work Carnahan family. Thanks Lisa! I love your newest pictures on Facebook!